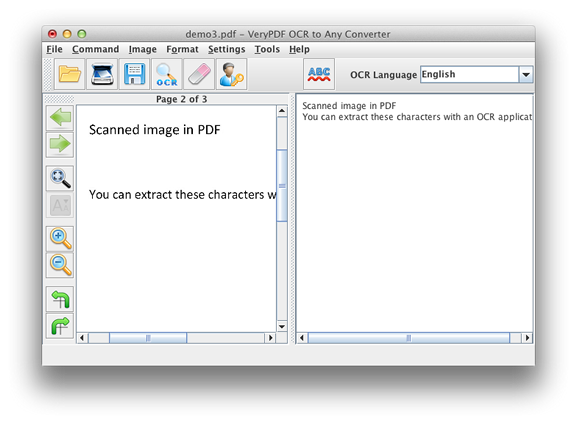 VeryPDF OCR to Any Converter for Mac is a useful tool designed to help you recognizing characters in images to Microsoft Word, Excel, RTF, XML, and TXT. OCR to Any Converter for Mac supports input files in BMP, GIF, JPEG, PNG, TIFF, and scanned PDF. With this software, you also can edit the fonts, text case and check the spelling before saving the recognized text. 1. Recognize characters in images of BMP, GIF, JPEG, PNG, TIFF, and PDF. 2. Save recognized text to Word (doc), Excel (xls), RTF, XML, and TXT. 4. Pre-process (de-skew) image before recognition. 5. Change image page orientation before OCR. 6. Edit recognized text before saving. 7. Use custom word dictionaries to check spelling of recognized text. 8. Provide accessories for merging TIFF, merging PDF and spitting PDF. Provides MPP recovery services, allows repairing Microsoft Project documents on any PC. Get Project Recovery Toolbox if you encounter the damage of MPP files and there are no backup copies of affected documents to be applied. Office Timesheets is a web-based commercial employee time tracking software application designed for project-driven organizations to track time and expenses for real time reporting and billing. Integrates with Microsoft Project. Free trial.